I just got a sneak peak of the printed version of The Skinnytaste Cookbook and I’m beyond thrilled for it’s release on September 30th, and am so grateful for all of your enthusiasm and support so far! As an added bonus (and a thank you to all of you who have already ordered the book! ), if you pre-order The Skinnytaste Cookbook by September 30th, I will send you 3 FREE bonus recipes that I created exclusively for you! These recipes do not (and will not!) live on skinnytaste.com or in the cookbook. 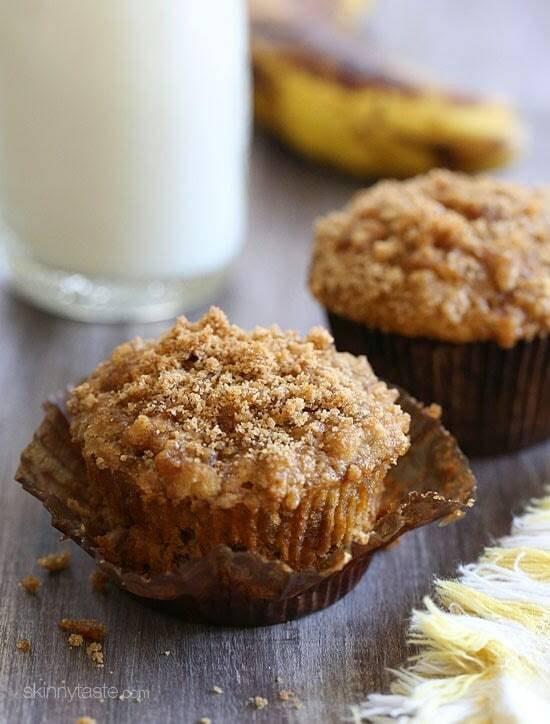 Whole Wheat Banana Crumb Muffins – these scrumptious muffins are a favorite in my house, whenever I whip up a batch they quickly dissappear! 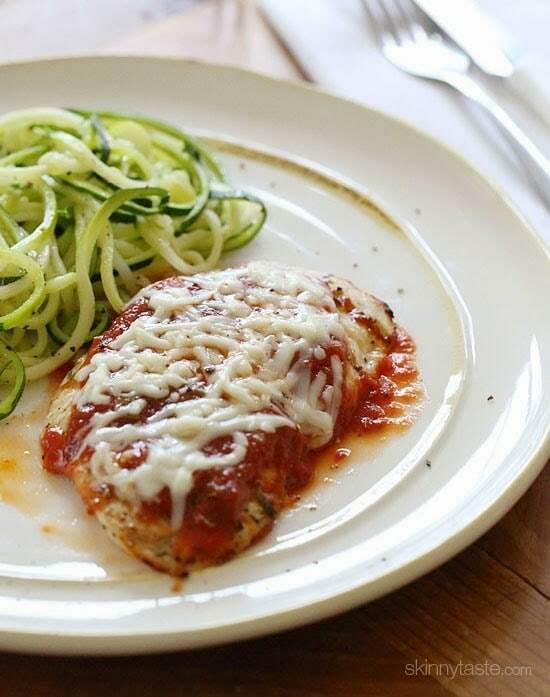 Easy Grilled Chicken Parmesan – perfect while it’s still hot outside, I tell my daughter it’s chicken pizza and she loves it! Takes less than 20 minutes to make and no heating the kitchen! 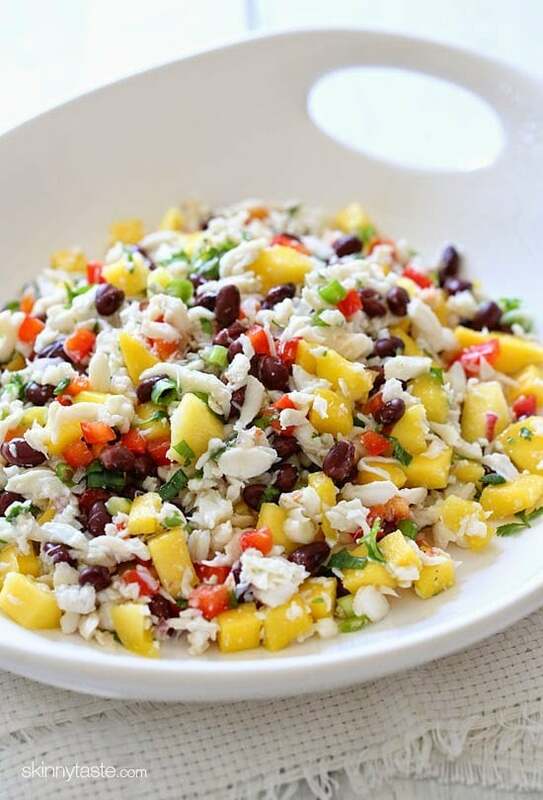 Zesty Crab and Mango Salad – fresh and light, and so easy to prepare! All you have to do is pre-order the book from your retailer of choice (see links here) and send your proof of purchase to [email protected] to receive a link to download these three recipes! This offer, of course, also applies to everyone who has already preordered their copy of the book as long as you send a receipt. I just wanted to leave a comment to say that your “House Salad” has totally revolutionized the way I think of salad. I don’t always try to be real careful with the calories (I may use extra oil, and extra avocado), but without giving away too much here (so people will still buy the book), the method you describe for creating the “dressing” through the slow process of adding ingredients a few at a time is freaking GENIUS!!! I never would have thought. I know that cooking is really a series of chemical reactions; for me, this no-cook method takes the cake. Mmmm craving that salad RIGHT. NOW…. time to go to the grocery store!!!! Hi Gina! I sent a proof of pre-purchase however, I did not receive anything in regards to bonus recipes etc. Do you know how I can get these? I would be more than happy to resend it. Thanks! Hi, Same question as everyone above – how do I receive bonus pack 1? Thank you! I agree with Susan/Anonymous… I would like to have this bonus pack as well. I emailed the publisher and Gina but I haven't gotten a response yet. Any update on the issue of not receiving bonus pack #1? Thanks! I have the same question regarding receiving bonus pack #1. I sent in the proof of purchase and I received bonus pack #2 but not #1. Can you please post how to receive the recipes? I haven't received my 3 recipes. I can't wait for the cookbook! Almost every meal I cook now comes from here. I received Bonus Pack 2. How do we go about getting bonus pack 1? Same question from me, I'll check back to this thread regularly. Thanks! Same questions, how can I get bonus pack #1, I have bonus pack #2. Super excited for your book and can't wait to try the recipes! I preordered from Amazon and received the link to download the bonus recipes; however, I got the bonus pack #2 which does not include the Whole Wheat Banana Crumb Muffins, Easy Grilled Chicken Parmesan, and, Zesty Crab and Mango Salad recipes (these were the deciding factor for me to preorder). Any way I could get these recipes instead? I've emailed the address provided several times and each time they provide the same link for the bonus pack #2. Please help! This is coming out on my birthday!! Exciting! Congratulations on all of your success Gina! I preordered the book but have not received the recipes. How do I get them? Hello there…. not sure how to get the freebie recipes after I pre-ordered. Should I send you some link from amazon.com with my pre-order???? I just ordered mine! I cannot wait to buy them for my family and friends!! I tell everyone about your website! It has changed the way I cook and makes me look like a star!!! Thank you for all your hard work! Looking forward to getting my cookbook! The salad looks fresh and delicious, I would like to learn how to make it. I preordered my copy on Amazon and sent the confirmation to the email address 4 days ago, but I have not received the free recipes. What should I do? Thank you all for your support, I am beyond grateful!!! I got my hubby to pre-order it for me for my anniversary present, I am beyond excited!!! Hi Gina, I would also like to know if the book has WW points. It does not as legally I cannot use the points in the book, but you can easily use your calculator with the full nutrition values to calculate, or I can even email you the points. I don't usually leave comments, but I wanted to let you know that your website was one of the major contributors to my 40 lb. weight loss. I love searching through the recipe guide to find something new and exciting! Thank you so much for making my weight loss journey so much more fun than I ever thought it could be! You make incredibly delicious food that doesn't taste 'diet' and even all of my non-dieting family members love your recipes. I cannot wait to receive your cookbook (literally counting down the days…) and I wish you much success! I preordered this book a while ago, as I love your recipes. Thanks for the extras, I have bananas on the counter that need a home. Does the new cookbook have WW points? I love that the site does. I ADORE recipes and am excited about the new cookbook. I received the 3 recipes and was concerned because the WW point values are not calculated as on the recipes on your blog. Will they be in the cookbook? I HOPE so! Thanks for your great work! Legally I cannot add the points, but you can use your WW calculator or I can even email you the points when the book comes out. YOU ARE SO SO SO AWESOME. I am thinking about ordering the Kindle Version so that I can have it with me everywhere. Will I miss anything in the Kindle Version or does it have everything the hard cover version does? Thank you. I'm really excited! Love your recipes!!! Just ordered from Barnes & Noble! Can't wait to see the beautiful photos and to make those banana muffins! Make sure you send proof of purchase to [email protected] to get the 3 recipes! Preordered but not sure how to get the 3 recipes. I am very unsavvy on the computer. I pre-ordered this a couple weeks back from Target! Can't wait to get it! Congratulations Gina, it looks beautiful! Is the recipe on the Books Cover also included. The Shrimp dish looks delicious and what a beautiful presentation. Shrimp and Grits, that's in the cookbook! I sent my receipt yesterday and didn't get a response? All these recipes look FABULOUS! Soooo excited for you Gina! XOXO! I pre ordered on amazon the first week of pre sale. I'm so excited for it to come out! I pre-ordered from Amazon. Cannot wait for its arrival. Hi Gina, I've just pre-ordered from Amazon.co.uk as I live in Scotland. Hope I qualify for the 3 recipes. What do I need to do? I could do a screenprint of my Amazon orders page which shows it's been ordered? I <3 your recipes, but I'm a vegetarian. Are you planning on making a vegetarian version? If so, I will gladly buy a copy asap! Around 95 of the recipes are vegetarian! Gina- how much of the book has gluten free recipes? I enjoy a lot of your recipes but if the whole book is not mostly gluten free (or gluten free adaptable) then I'm not able to purchase it. Thanks. Around 98 of the recipes are gluten free! I'm so happy to hear this! My mom is gluten-free and loves your recipes. Will be purchasing the book as a gift for her. Thank you! I just ordered mine on Target.com!! Woohoo can't wait!!! Hi Gina ~~ I pre-ordered the Kindle edition from Amazon. Will I get these also? Love your recipes and posts! I really do want to buy your book, but am not sure if I can pre-order in Canada. Do let me know. You can pre-order from Chapters Indigo. Pre-ordered it about a couple of weeks ago from Amazon and really looking forward to it! Will send my receipt when I get home! And thanks! And keep up the great work! Thank you for all of your recipes 1st of all we love them!! I am looking forward to the new banana muffin recipe!! Looking forward to this new cook book in the fall!! Wooohoooo!!! You have loads of wonderful ideas! Enjoy your day and thanks again!! Just pre-ordered. Love your recipes!!! Will there be a digital version for sale or a way to add these to a recipe app? Just ordered your cookbook!! I have loved all your recipes and my kids love them even more!! Because of you I lost all of my baby weight and then some!! I have never felt so good and so healthy before! I pre-ordered the Kindle version on Amazon. Now I'm curious, when and how will I get the free recipes. Thank you. Just send you're receipt to the email above, you'll get them right away! I just ordered your book! I am so excited for you, and for me (I can't wait to get it!) I actually have a notebook full of your recipes! I wish you much success with the book. Will the 3 recipes come automatically by email? Thank you for all your hard work providing delicious recipes! Can we pre-order in Canada somehow to get the free recipes? I pre-ordered your book! I can't wait to receive it. I love all of your recipes! Congratulations on your beautiful new book..
Just wanted to tell you we celebrated our daughter''s 39th birthday here yesterday and I made your Chicken Milanese with Arugula Tomato salad topping and all 6 plates looked beautiful..tasted wonderful..and not a speck was left. I love that, happy birthday to your daughter! Can we preorder the Target version? Didn't you say it has extra recipes? You can pre-order from any store, Target is fine! These 3 recipes won't appear in the book, they will be emailed to you. Free shipping when you purchase with your Target REDcard or debit! I dont see the cookbook on the Target site? does this mean they no longer are doing the pre-sales?